Address: 09 Ngo Quyen Street – Hue City – Vietnam. + Extra bed: add more US$ 22/person/night. + Check-in time at 14:00 , Check-out time at 12:00 noon. + Breakfast is US $8/net per person and 50% for children 5 to 12 years, no charge for children below 5 years. – Prior to 18:00: 50% of the room rate. – Later than 18:00: a full nightly charge. 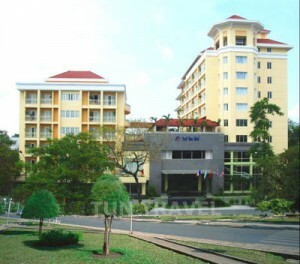 + Standard: room in 29m2 with king-size or twin beds for city view & balcony. + Superior: room in 32m2 with king-size or twin beds for city view & balcony. + Deluxe: room in 36m2 with king-size for river view and balcony. + Suite: living room and bedroom in 54m2 with king-size or twin beds for river view and balcony. + Family Suite: One King-Size Bed & One Single Bed in 76m2, living room for river view and balcony.